Meet Mikhael Paskalev, the Norway via Belgium descendant who's about to release his new EP 'I Spy' in the UK next week (18th Nov) via Communion Records. With the official video to its title track racking up over a million YouTube views since its release last year it's safe to say Mikhael Paskalev's non offensive blend of folk laced Indie-Pop melodies have been more then well received. The clip, directed by André Chocron, incorporates a clever and intricate amalgamation of slow-mo/real time effects creating one of the most infectious and desirable videos I have seen in a long time. The same can be said for the rest of the EP too. With a devine skill for conjuring up excelling finger plucked rhythms, there's no doubt on the EP's second track Susie we have a real talent on our hands. With his Americana-esque and quite frankly unique vocal delivery Paskalev manages to almost mould the tracks direction on the fly as he ebbs and flows through its evolving nature. As the pace slows on Come On we get the inevitable sentimental crooner that most musicians seem to hold in their ammunition, something few manage to craft in to such finery, but that's no issue here though. A Slow burning, fire crackling piece that truly sets the mood. With hints of a 50's Rock 'n' Roll influence running through its jangly guitar notes, the spacious calm only broken by the rumble of drums, it's clear to see the diversity within as the EP unfolds before us. As the final track Dust rolls in to pick up the pace once more to a more familiar tempo I'm not sure much dust would indeed be settling. As the strum of an acoustic guitar is met with a heavy bassline, locking horns in battle, you're quickly thrown in to a headrush of emotion as you're whisked in to the air on a hotbed of danceable energy. Add in a few dislocated stabs and some upbeat rolling percussion and you're on to a sure fire winner. 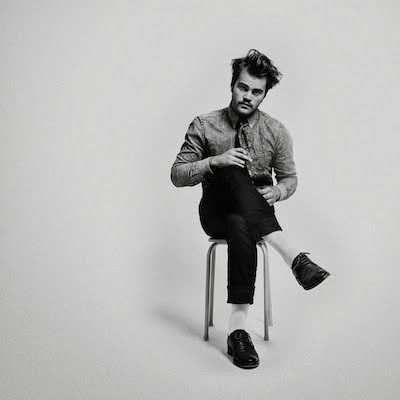 As far as debut EP's go Mikhael Paskalev's 'I Spy' is one engaging roller coaster ride from begining to end. I can't wait to hear what else the now Liverpool resident conjures up next. Paskalev will bring his live show to the UK for dates with Half Moon Run this November along with a headline London show. Full details below.